From Cahokia Mounds to the World's Largest Catsup Bottle, Collinsville has a lot to offer visitors, tourists and locals. Come and see the city's diverse attractions today. If you would like to receive a copy of our Visitors Guide or other area attraction brochure to assist in your planning, please fill out our request form. Collinsville is home to the largest catsup bottle in America. Dubbed as "roadside architecture as its best," the bottle is located on Illinois 159 (south Morrison) at the south edge of the city. The now-empty steel water tank was constructed in 1949 and restored in 1995. In August 2002, it was named to the National Registar of Historic Places. In 2010 the bottle was given another honor by being mentioned in the Twilight saga movie "Eclipse." 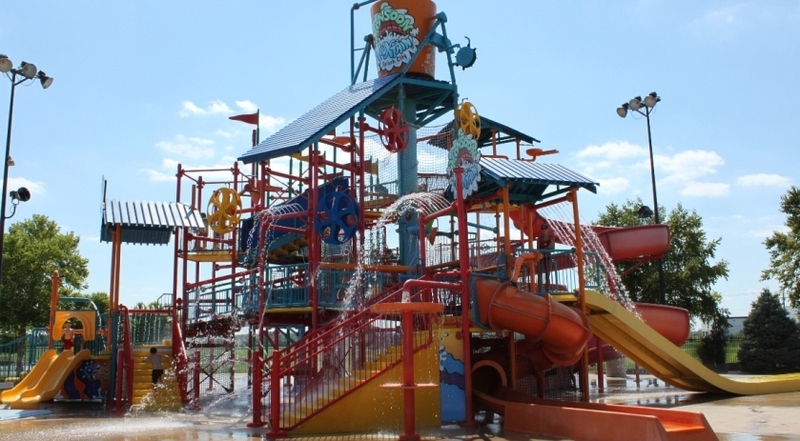 Soak up the summer fun at Splash City Waterpark! Come make a splash at the premiere water park for the Metro East. Splash City is home to 7 slides, Monsoon Mountain, Crystal Creek, Leisure pool, Oasis Lap pool, and the Aqua Climb Wall. At Splash City, you'll never pay for parking, all our inner tubes are free, and you'll never be charged to use any of our life jackets*. Visit www.SplashCity.org for information about aqua fitness, swim lessons, birthday parties, and special events. A United Nations World Heritage Site since 1982, Cahokia Mounds State Historic Site is the largest archaeological site in America and is the home of Monks Mound, the largest prehistoric earthen construction in the New World. The 100-ft-tall, four-tiered platform of Monks Mound was built in stages over a period of 300 years. Its base covers more than 14 acres and contains about 22 million cubic feet of earth. At one time, the Indians' principle ruler lived, conducted ceremonies and governed the city below from atop the massive mound. Many one-of-a kind jewelry items, as well as educational books, tapes, games, souvenir items and replicas of objects found during archeological digs, are featured in the gift shop. Listed in several publications across the St. Louis area as one of the best and favorite free things to do in our area! Visit Cahokia Mounds for special events like Indian Market Days, Archaeology Day in August, City of the Sun 5k Trail Run in November. Tourists and locals have been coming to this historical landmark for years. In addition to a World-Class Interpretive Center, Cahokia Mounds offers 2,200 acres of the original site, 800 of which are accessible to the public. No trip is complete without exploring the site, climbing the 100 ft. Monks Mound and experiencing the reconstructed ancient sun calendar, Woodhenge. Guided tours and ipod tours are available.